Overview. 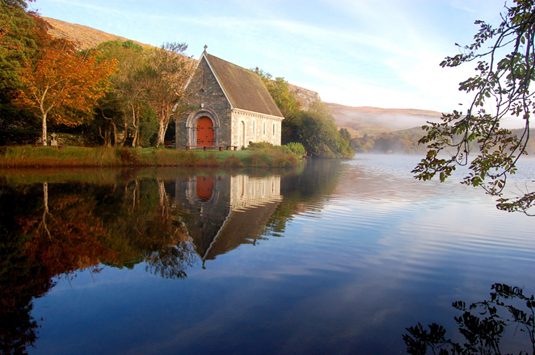 A charismatic pilgrim route offering unforgettable vistas as it leads in fine style over the Sheehy Mountains and valleys to Gougane Barra. Denoted by the brown Slí Bharra plates, the path follows the route of the Sheep’s Head Way and then Beara Breiffne Way from north of Kealkil – it requires 2 days to complete. Grade. Strenuous trail traversing a considerable amount of high, isolated terrain. Most suitable for experienced walkers with good boots, gaiters, warm clothing and raingear. If in doubt, join an organized walk. Information on these at www.topoftherock.ie. Time. 6-7hrs on each of two days. Trailhead. On the ring road around Cork city take the N71 to Bandon. Then follow the R596 through Dunmanway to Drimoleague. Walk begins at Top of the Rock, 1km north of the village. Passport Information: 086 1735134, Bookings to: davidross316@gmail.com. Transport. Transfers between Gougane Barra and Drimoleague are available to pilgrim walkers at a special rate €40 to transport 1 or 2 persons. Local taxi man, Timmy O’Driscoll, is offering this service. His contact number is (086) 600 8335.